Autism seems to be on the rise. Certainly, in recent years, more children are receiving treatment then ever before. 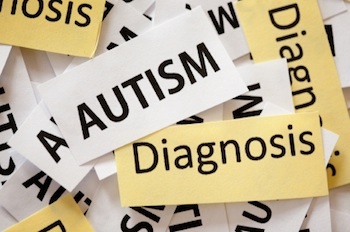 People with Autism Spectrum Disorders (ASD) exhibit a triad of symptoms: impaired social interaction; impaired communication and imagination; and rigid, repetitive patterns of behavior. The triad is recognized at all levels of intelligence and can occur alone or together with any other physical or psychological disorder. Autistic children often lack an ability to make eye contact, don’t show affection, and have physical tics. However, autistic children can be extremely intelligent. The effects of autism on a family are often astronomical, drastically altering the entire family dynamic and demanding extreme but critical changes in daily routines and plans for the future. Children with autism spectrum disorders can learn to function and thrive as long as they are properly diagnosed and treated. The treatment process usually involves the whole family, as autistic children require routines and disciplined socialization. Autistic children can learn to express emotions and engage in social interactions. Special education, close monitoring of the child’s behavior, and consistency in treatment early in life will help autistic children learn to care for themselves, develop interpersonal relationships, and obtain job skills. The primary goal of treatment is to lessen any developmental or behavioral deficits and to minimize family distress while promoting functional independence for the child and improving quality of life for all. As with many psychological disorders, there is no one-treatment-fits-all that works for autistic children. Effective treatments must be tailored to each child’s needs. There is a range of disorders within the autism spectrum, and a thorough evaluation is necessary to determine whether the child has this condition or an associated condition. My goal as an autism psychologist is to ensure a comprehensive evaluation and correct diagnosis so I can formulate an effective, personalized treatment plan, providing therapy and coordinating a multidisciplinary team approach, which often includes working intensively with parents to help them understand their child’s condition and to help them learn ways of coping, as parents, with ASD. My mission is to help children overcome the effects of autism while helping parents and families cope with the consequences of autism. Asperger’s Syndrome is one of the autism spectrum disorders. It differs from autism in that the symptoms are less severe and the language delays common in autism are absent. Few professionals have significant experience in helping patients with Asperger’s syndrome. My training and experience with Asperger’s Syndrome allows me to effectively diagnose and treat this condition. As an Asperger’s psychologist, I am typically involved in three main efforts: to evaluate someone for Asperger’s, to provide the treatment appropriate to Asperger’s, and, in some cases, to help others in the person’s life manage the effects of Asperger’s. To schedule a free initial consultation with Dr. Kenneth Roberson, please call 415-922-1122 or email info@kennethrobersonphd.com. *From the Center for Disease Control (source).